Georges Blanc is a restaurant and hotel that we have been to many times, but not so in recent years. 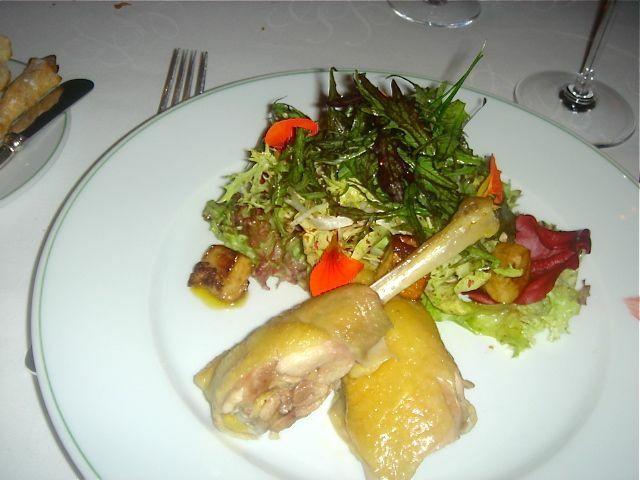 Our plan was to have a light lunch and and a special ordered Bresse chicken dinner. We had requested the same room [# 27] that we have enjoyed at Georges Blanc on several other visits. It was nice to see that it is just as we remembered. Of course, who can resist starting the day with a coupe de champagne. 1. Spicy tomato soup with paprika and 1/8” dice of cucumber at the bottom. 2. A slice of foie gras pate on a spoon. 3. A frog’s leg done tempura style, on a spoon. 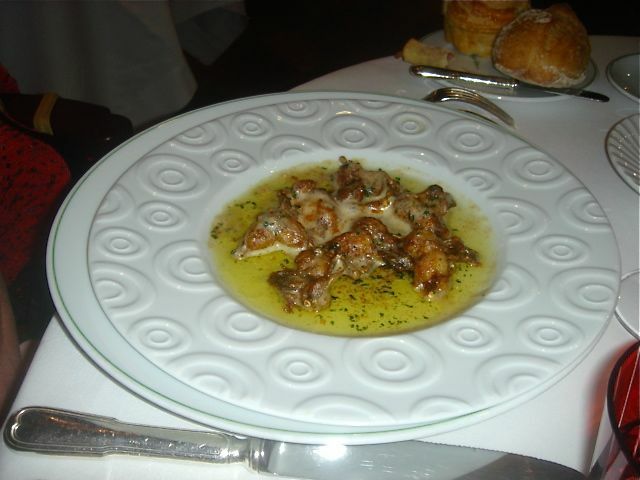 Me: Frog’s legs sautéed in a traditional parsley butter, garlic sauce “comme en dombes”. The frog’s legs are served in 2 servings so the second serving does not get cold. The first time I had this dish at Georges Blanc as a very naïve American I insisted that they must have made a mistake when they brought the second serving…the answer “Non Madame, this is your required second serving” and of course I devoured every bite as I did on this day 15 years later. 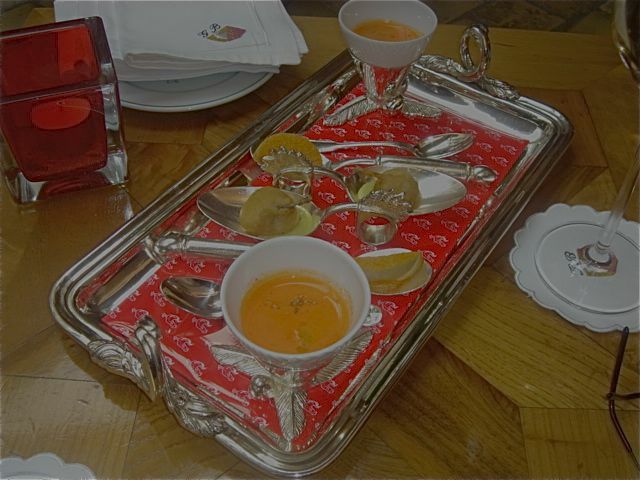 Initially, we were presented with the same amuse that we received at lunch. But, almost before we recognized that the amuses were identical, the maitre d’ noticed and quickly took the plates away. No way would he have us served the same thing twice! 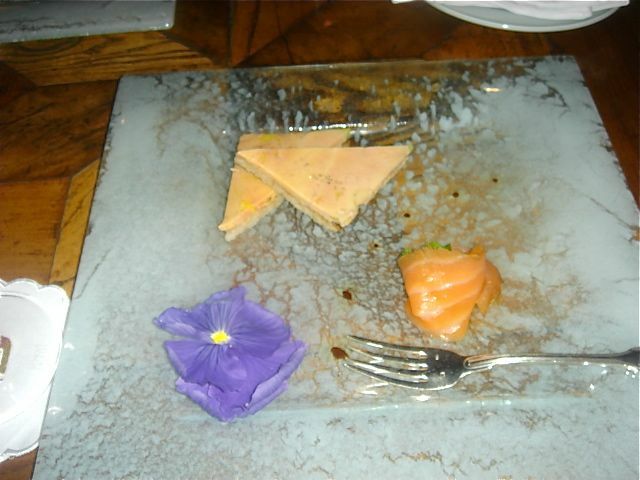 Foie gras on toast with a smoked salmon “rose”—delicious. 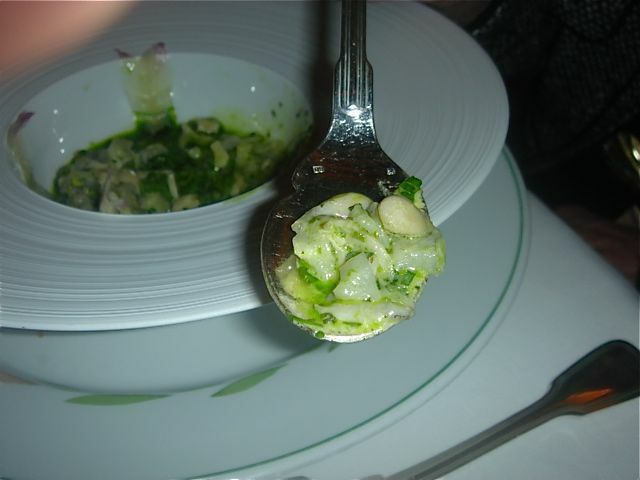 Frog’s leg meat [no bones] with ¼” dice of artichoke hearts in a basil/parsley sauce. 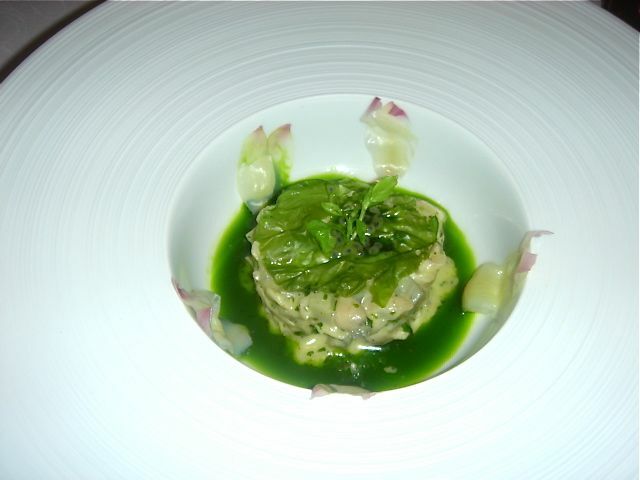 4 tender inner artichoke leaves surrounded the plate and some crispy basil covered the mound of frog’s leg meat and artichoke. Who would have ever thought that artichoke would marry so well with frog’s legs? Delicious and different! 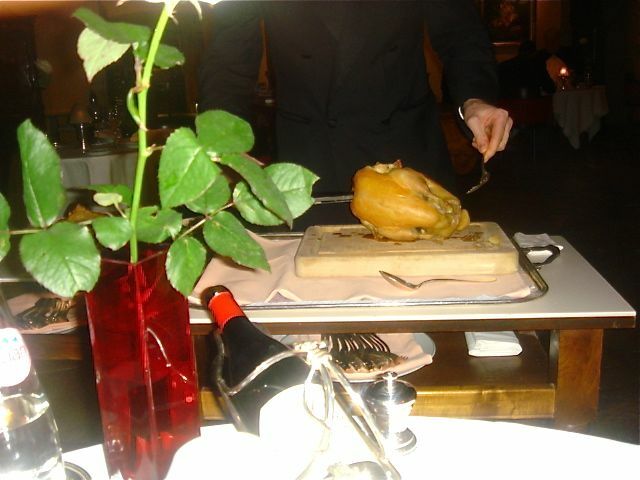 We had pre-ordered the Poularde de Bresse cuitre en croute. It can only be had as a pre-ordered dish at least 48 hours in advance. 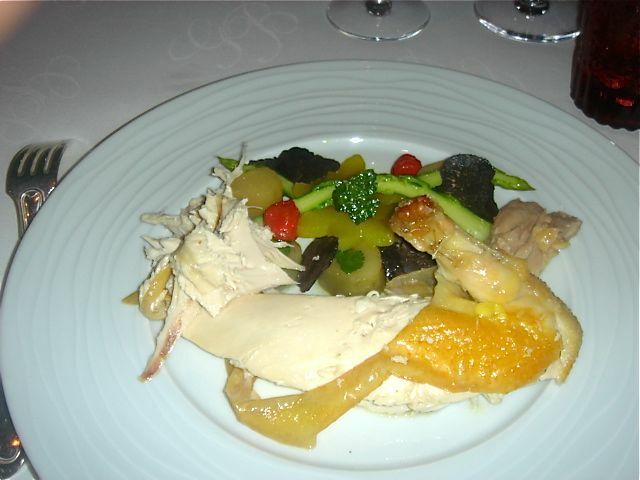 Most people don’t know of this dish and order the classic Bresse Chicken G-7 that is on the regular menu. Personally, I thinks it is a horrible dish—a beautiful breast of Bresse chicken drowned in a cream sauce. 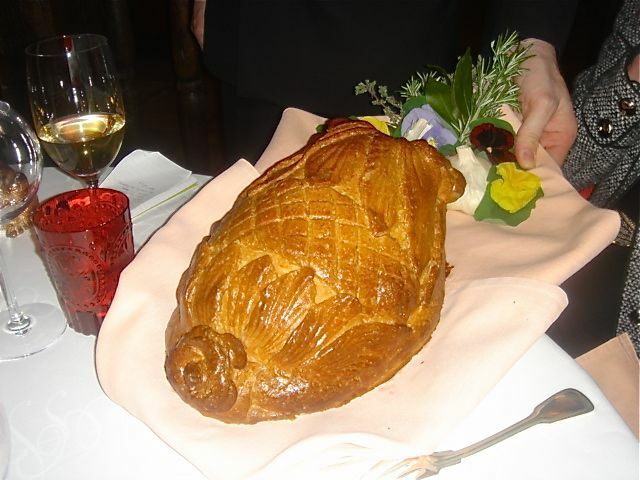 The Bresse Chicken we ordered is cooked in a pastry shell and it is wonderful. 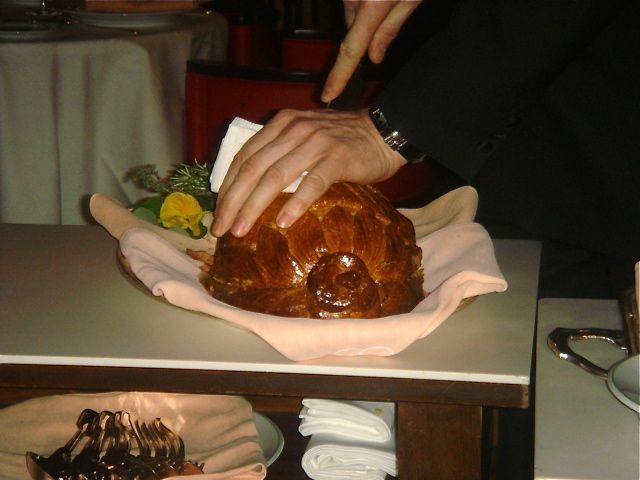 It is first presented whole, the crust itself is a work of art that would make any pastry chef proud. The chicken is not returned to the kitchen. 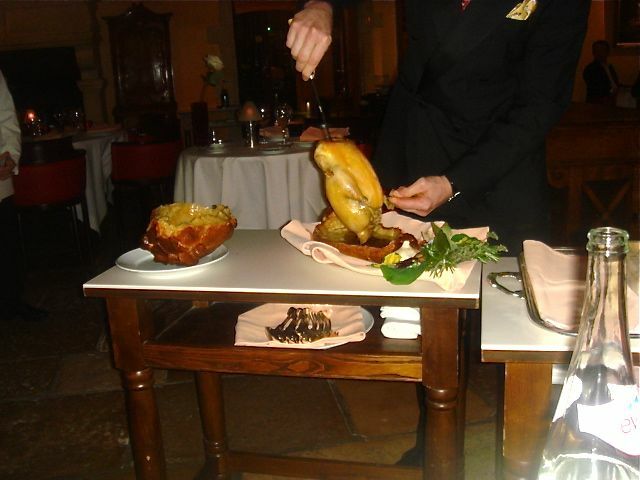 Instead the Maitre d’ [probably the only one who remembers how to do it, since it is served so seldom] prepares the dish table side. First the top of the pastry case is cut and removed. Then the chicken is picked up by a prong, tail end down, and all of the juices from the chicken run into the removed top crust. 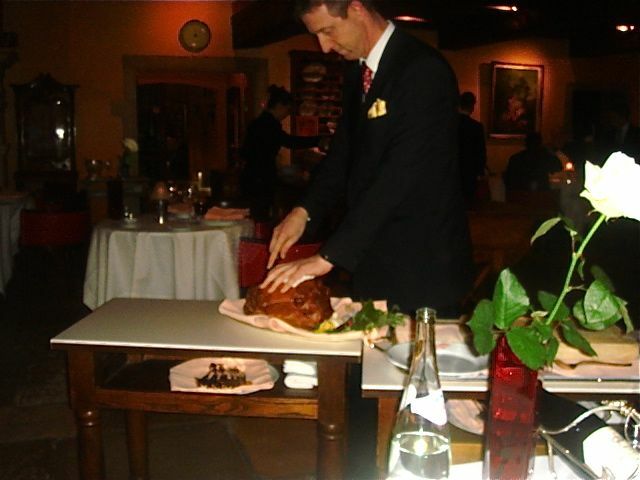 Next the chicken is carved tableside – another work of art. 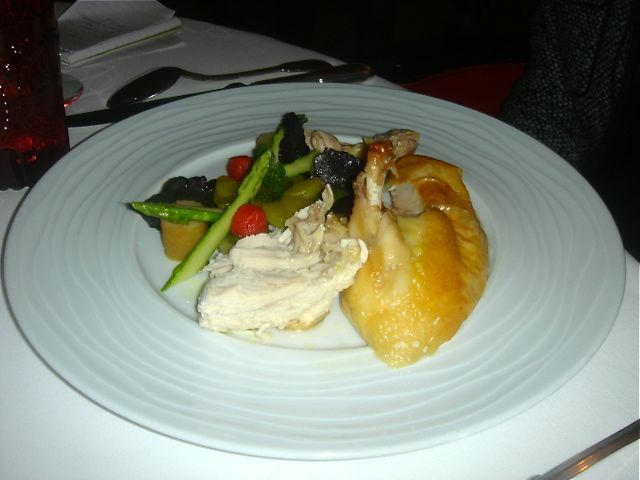 The chicken breast is plated with vegetables [asparagus, broccoli, potatoes and a couple of slices of black truffles]. Then there is the second service—the legs are served with a salad sauced with the jus from the chicken that also include the sautéed chicken giblets.. Absolutely delicious and classic Burgundian cuisine. No fromage, no mignardises – this is a very filling dish. 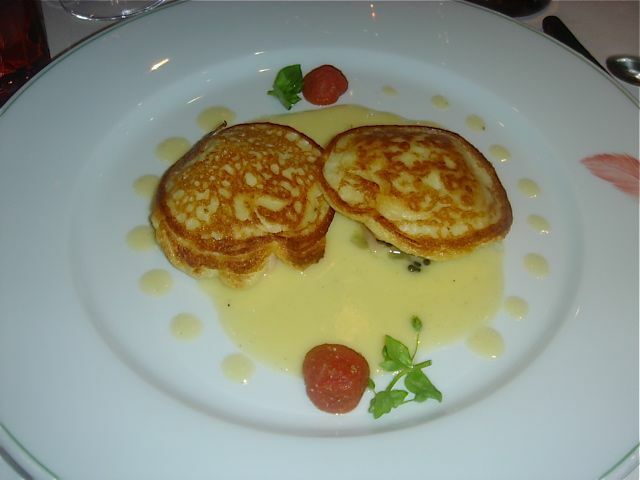 Lunch—2002 G. Muscovack, Pernand-Vergelesses—held up very well to both the frog’s legs and the pancakes. 1997 Vosne Romanee Beaux Monts, D. Grizot—excellent with the Chicken—full bodied and still young. We were worried that Georges Blanc would let us down as it had been so many years since we had been back. We visited with Georges Blanc who looks great at around 66. We seem to remember discussing birthdays when he and John were both in their 40s. His son is running things along with a daughter in law. Bottom line – This is not cutting edge cuisine and you have to “know” what to order. But it is excellent food, representative of the region with attentive and gracious service.